This is the 29th edition of our periodic guest post series called 10 Questions and a Pizza Place. (The 1500′s are pizza fanatics.) We have a list of 17 questions we pose to fellow financial bloggers, and they are free to pick and choose 10 or answer all 17. Let us know if you would like to be featured in a future edition of 10 Questions. Once out in the real world I took a job at a consulting firm. …Needless to say those years were exciting and at the same time boring. I looked around my office and saw people that were miserable. They made good money, but rarely saw their families. Worst of all they deluded themselves that they were working these jobs because they “had to for their families”. Bryan is right-on here. Way too many folks these days seem to be getting caught up pursuing an empty life and forgetting about what really matters in life. My blog is www.IncomeSurfer.com. 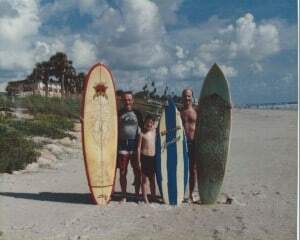 I am a third generation surfer with passions for writing, investing, and travel. I publish a free monthly newsletter about changes in our portfolio, stocks I’m looking to buy/sell, and interesting articles that provide a historical perspective for the current stock market. Content on blog itself is evenly split between lifestyle topics and financial ideas. I’m pretty well rounded and I think that comes across on the blog. Finally, you and I are both blessed to be part of this amazing online community. A large part of what this community (and the blogs within it) great, is the regular interaction with our outstanding readers. I would take $50k of it and go on a year long road trip with my wife, our son, and our Labrador. Actually, that’s what we’re planning to do anyway….so I guess it wouldn’t change us much. The balance I would systematically invest over a year long period in a REIT index, Emerging Market index, Bond index, and Global Stock Market index. I like to manage my own investments, but if I am traveling extensively I wouldn’t want to be tied to a computer screen. The very essence of practicality, haha. I drive a 2010 Honda Accord. I knew I needed to start driving a lot for work and my old Ford pick up was about to give up the ghost. I looked and looked and couldn’t find a deal on a used Honda or Toyota that made sense, so I took the plunge and bought the most basic of basic Accords. It accomplished my goal of balancing between value, safety, and economy. I paid cash, but four years later I still can’t believe I bought a NEW car. If I had my druthers I’d be driving a late 1960’s Bronco with a bikini top or a early 1960’s Vette. How would that work with our newborn in a car seat exactly? Or for that matter driving 70 miles a day for work. A lot of people inspire me, in different aspects of my life. My wife and my mother both inspire me with their open and generous hearts. My Labrador inspires me because she’s always so happy to wake up and live life. My mentor in business, Alex, inspires me because he always believes we can modify a deal so that everybody wins. Jim Rogers inspires me with how he blends investing and his love of travel. John Bogle inspires me with his reasoning and practicality. The list could go on, but you get the idea. I tend to be a bit of a maverick and I think my answer is two fold. 1) I bought a house below what I could afford. 2)I invested a great deal of my money when the global stock markets collapsed in 2008-2009. My family thought I was nuts on both counts, but I think the results speak for themselves. Pay yourself first. Systematically put money into a savings or investment account and live on the rest. It’s incredible how little you need to spend when that’s all you have. I learned this the first time I was laid off. I was living the exact same way……on about half as much income. My wife and I are working toward financial independence. We’re most of the way there. Once we achieve it, I can focus strictly on the five things I’m most passionate about: 1. Family, 2.Travel, 3.Volunteering, 4. Investing, and 5. Writing. For us Financial Independence isn’t about a dollar amount, it’s about our time and our passions converging to live a fulfilling balanced life. I would say follow your own instincts and don’t listen at all to your family or friends. The things I have done because they were the “right things to do” have not worked out so well. The things I have done because I knew the risks and wanted to go for them, have turned out great. This pattern has played out over and over in my life. So I would try and save myself a lot of heart ache and tell myself to make my own decisions. Take that really great trip NOW! There is always time to settle down later, but life is what you make of it. Adventure is out there, go find it……and blog about it along the way. A lot of people are quick to give other people advice, but don’t really know what they are talking about. A mentor once told me never to listen to advice unless the person was living (or had achieved) what I was trying to do. I have found that this is true. Most people are just talk and will tell you the 1,000 reasons you shouldn’t do something, but they really don’t know what they are talking about. I see a lot of people living their lives either to impress their neighbors or friends. Neither of these reasons will lead to fulfilling lives. There will always be someone else with more money or stuff than you (they are often better looking to boot). Who cares what they think?! Live YOUR own life and strive for your own balance and fulfillment. Thank you Bryan for your submission! Show him some love over at Income Surfer and on Twitter. Nice to meet you Bryan! That is fantastic that you are on your way to financial independence. I am working towards getting out of debt, and putting money away so I can focus on what is really important, too. Life is too short. I look forward to checking out your blog! Hell Mrs. FF. Thank you for the kind words. It’s incredible what you can accomplish once you train your brain to think a certain way, and get in the habit of looking for ways to enjoy life. You’re completely right that some people let money control them……but, we all know there is more to life than money! Pizza and Florida don’t seem to mix; at least in my mind. When I think Florida, I’m thinking of oranges and seafood. No conch fritters (aka little rubber balls) though, yech! You must have had rather poor conch fritters my friend. I urge you to try them again, they can be outstanding. Most Gulf fisheries were hurt pretty badly by the Macondo spill in 2010, but I do make an outstanding baked garlic butter scallop dish. It’s good to see you again as well Mrs. Pop. Yeah, I like pizza….but there aren’t a lot of “uniquely awesome” pizza places around me. My wife makes an outstanding pizza though, which I shared with Mrs 1500 some months ago. I hope you guys and the fur ball are well! Nice to get to know another PF blogger, and well rounded one, I might add! I’ve got 5 years to financial independence! There’s a positive spin on my debt situation! If you’ve got investing tips on your blog, I’ll definitely be by! First time I’ve ever seen someone on the early retirement blogs mention Jim Rogers. I’m a huge fan of his. Thanks for noticing Zut. You’re correct, very few in our community talk about Jim. I’ve been a fan for years and have read all of his books. Several are included on the recommended reading list on my site. He’s an arrogant fellow, but I enjoy the way his mind works. He’s passionate and inquisitive, both of which make him an interesting fellow…..and a contrarian investor. Nice to meet you! I’m glad I get to add another blogger to list of blogs I read.